The sand was EVERYWHERE. Sand. Sand. Sand. No mountains, no mirages of lakes, no sand dunes. Just soft, puffy sand that felt like hot coals every time we dared to touch it. 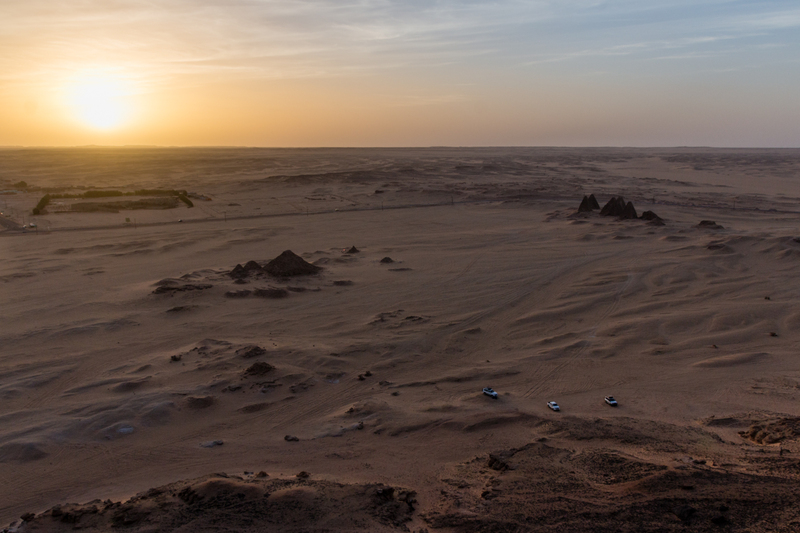 We had decided to cut across the desert instead of following the Nile between Dongola and Kerima. Just the other day, I would have sworn we were crossing a different desert. Now, it looked like we had touched down on the surface of Mars. And it might as well have been – it was the most desolate place we have ever stepped foot on. The only thing that broke up the tedium now and again were black boulders scattered over the sand plains. We did come across something unexpected though: a herd of wild camels. Fourteen of them! 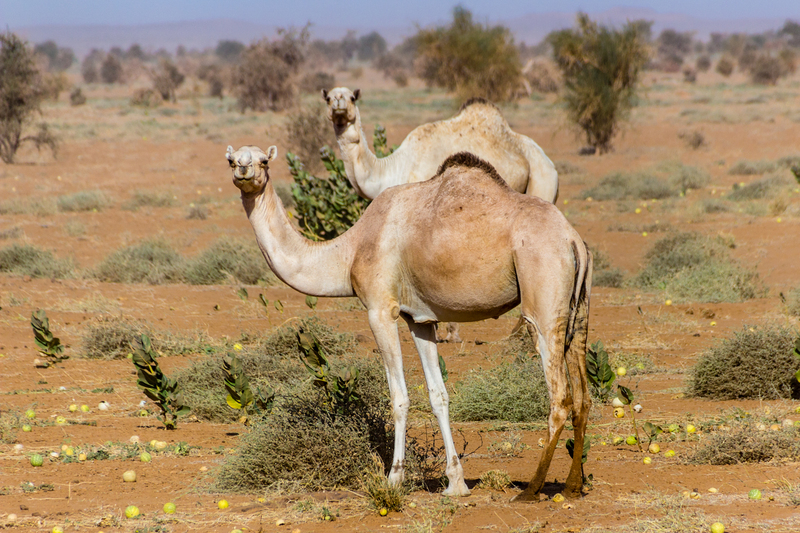 Camels are curious animals and their curiosity is always heightened when they see us. This lot just stared at us, as if to say “it’s the desert. What are you orange and red coloured idiots on wheels doing here?”. 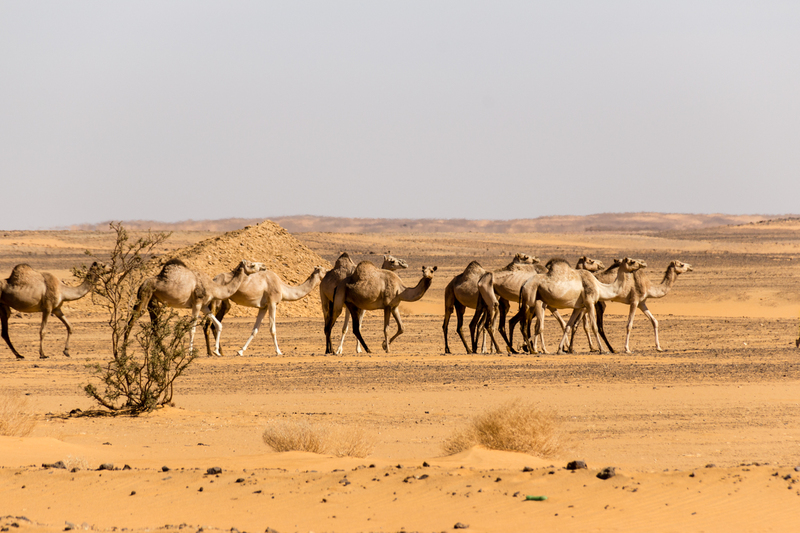 Although curious, the wild camels are also timid. They always fight an inner battle of choosing to say hello or getting the hell away from us! But here we stood, taking in the sight of their shapes against the similarly coloured sand. They stared at us. We stared at them. They stared at us. We stared at them. They stared longer. We stared longer… After our awkward staring contest, they eventually left in single file, wandering off into the vast sea of sand. How can any animal survive out here? Especially such a large one! If they were searching for a borehole, we hope they found it. They are not the only animals in the desert. When we paid attention, we saw dung beetles, grass hoppers and even birds. One morning, we found mysterious tracks leading up to our tent, most likely a mother and her cub. So apparently, there is water out here. It is a precious commodity but even more precious for some. Twice, we came across men walking! WALKING. We thought this was desolate terrain but to walk here…. Uh uh. We couldn’t believe it. They immediately stopped us for our precious water supply. Why were they walking here and where did they come from? These are questions we still can’t answer. They might have possibly been refugees from neighbouring Eritrea but we’re just speculating here. The second man had clearly been walking a loooonngg time. His ripped clothes covered his head and body, protecting him from the brutal desert sun. We gave our spare bottles to the much healthier looking first man, not expecting to see another. We could not leave the second man without water and so, he used our bottle instead. His next actions were interesting to watch. He threw out the first sip of water onto the ground. He then poured the water into his mouth without touching it to his lips. Hygiene and disease might have been a factor here. He did not look healthy himself, though. After we gave him food, he continued on his way towards Dongola. Every second counts out here. However, we were running low on water by now. We searched for more water and were surprised to come across a farm being developed. A guy offered to fill our water bottles and we walked over to a pump. However, the water came out with a strong stench of sulphur and we clearly declined his offer of tea. To be safe, we kept the water as a backup. We abandoned this plan that evening when the water had turned an unhealthy green. We emerged out of the desert to the city of Kerima where I struggled through another cold shower. Luckily, we have a solar shower bag to warm the water so I didn’t freeze to death. The alternative would be not taking a shower at all, in which case Simon would die. We climbed the mountain ‘Jebel Barkal’, which was sacred in ancient times. At the top, we saw the Nile river slicing through the desert. The only thing separating the water from the sand was a layer of green palms. The sun set over the Kushite pyramids below with the birds playing and diving in the wind above the mountain. The desert cold quickly set in and forced us off the mountain. Getting down was much quicker and we had fun jumping down the sand where we felt like kids again. In true Sudanese style, we were invited to a house nearby for tea where they showed us around their house and explained their daily living. They were very funny and we had a lot of laughs with them. 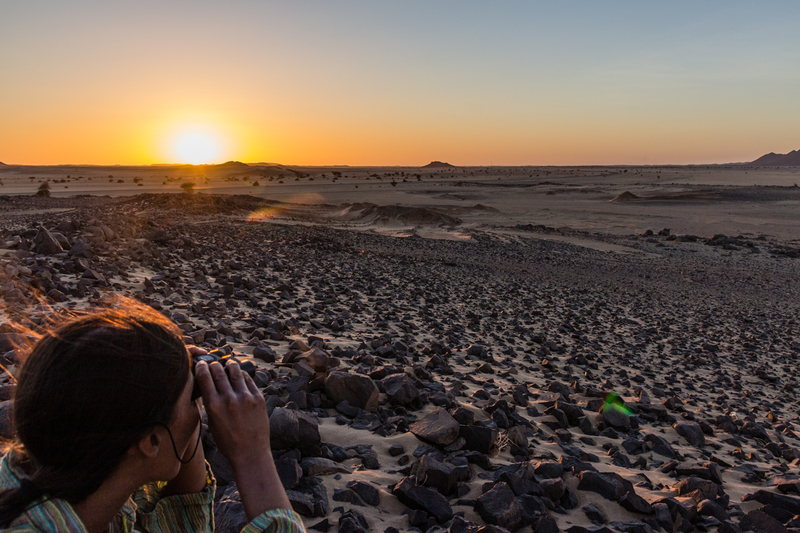 We went back into the desert for another three days towards Atbara. Surprisingly, there were many bedouin villages dotted along the way and the area was much greener than expected. 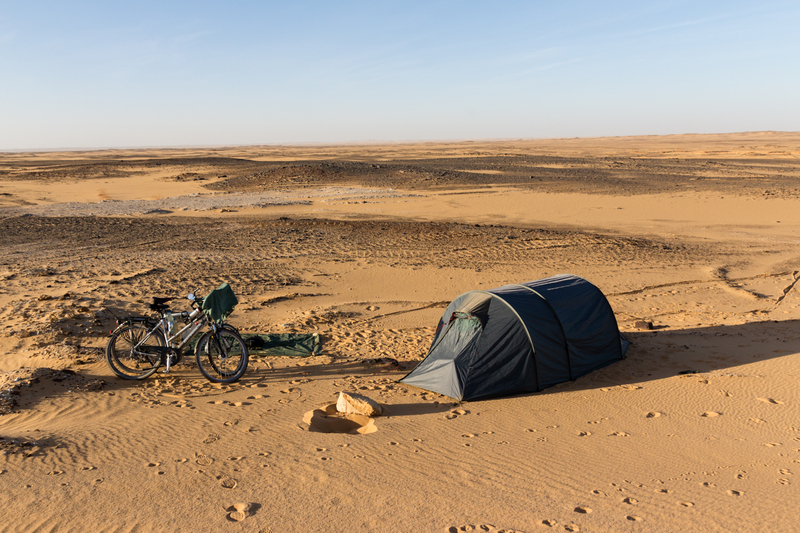 We pushed the bikes between some hills where we overlooked a vast plane of sand and mountains and camped next to a herd of six camels, who were eating lush trees. At sunset they left their dinner, and us, and walked into the distance. 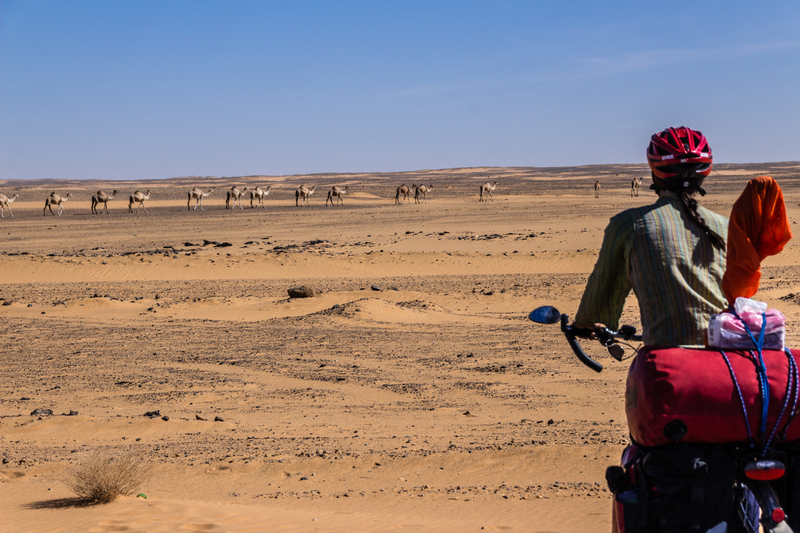 We must have seen about 50 wild camels on this stretch. Including two cute and curious youngsters. Unfortunately, most of them were kept by the Bedouin. They sometimes tie the camel’s legs together so the herd didn’t run away. A donkey had managed to run away but it still had its legs tied. We tried to get the rope off but it was way too scared of humans. Probably for a good reason. The last day in the desert, we were completely sand blasted. It wasn’t exactly a sand storm, but as newbies in the desert this sure felt like one. 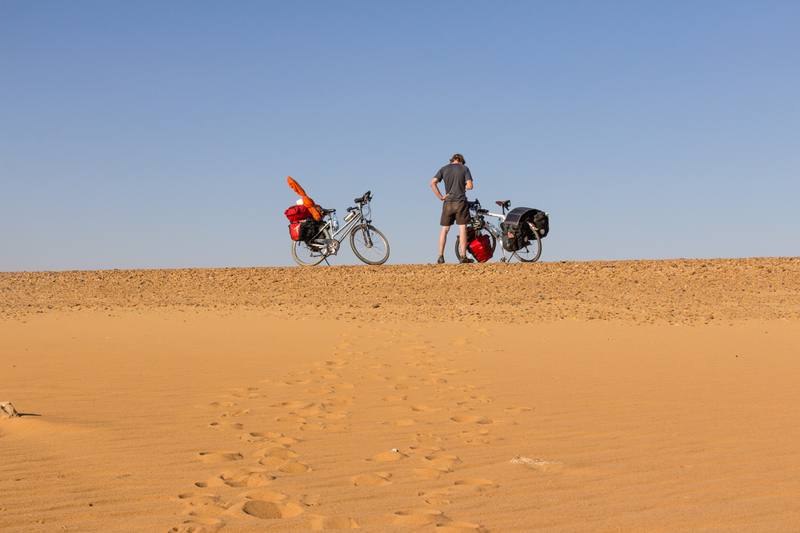 We had 100 km of a strong side wind blowing sand into our nose, ears and mouth and it was difficult to breath and see just 20 m ahead. I wrapped my buff around my face. Simon, did not. The sand got everywhere and stuck to his sunblock. By the time the day was over, he was half brown and half white with a clear line down the middle. Time for a shower and a rest and unexpectedly bumping into old friends. 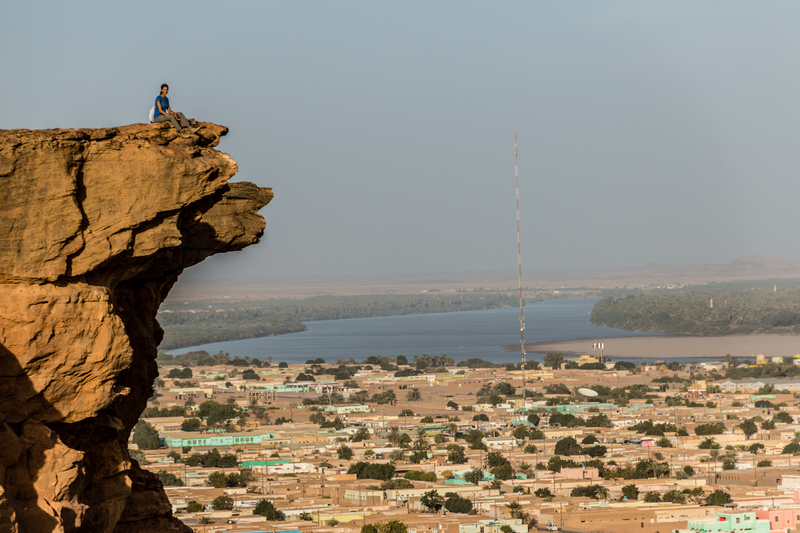 For more photos from Sudan, see here. Subscribe to our newsletter on our homepage for more updates from the road.